Everyday LS Half Zip - Mens is rated 4.1 out of 5 by 22. Rated 2 out of 5 by ValerieM from Disappointed by the favorite brand It was one from my husband's favorite shirts (among other Icebraker shirts because of color, it's lightweight but warm and stylish) until some holes occured on it's sleeves and on chest. We're with you gus for years and looks like now quality's getting worse but we still on buying for sure :) Hope it was only occasionality with our shirt not tendency. Rated 2 out of 5 by BCexplorer from A little disappointed I bought this shirt for hiking and other outdoor activities, hoping it would be thick enough to keep some of the cool wind out and bugs from biting through it while keeping me cool as advertised. I am 6'2 and fairly thin, so I bought a large, following the size chart. As soon as I tried it on I noticed how tight fitting it was.... too tight. The second thing I noticed was it is so thin I can see through to my chest. It is no doubt cool (I can feel the breeze just walking through the house) but for me that's pretty much the only upside. I can't imagine bush whacking or even going for a walk with mosquitoes around as they would definitely bite through. If what you're looking for is a shirt that will be cool for strenuous activity and you like the superman spandex fit this is probably a good choice. Otherwise I would suggest steering clear. Rated 4 out of 5 by feumar from Functional and Comfortable I wear this while alpine skiing. There's only one con: the lack of a "chin guard" -- tiny cloth flap to cover the very top of the zip -- to protect my neck against a cold metal zipper. Rated 5 out of 5 by Qualitynotquantity from tried, true, tested In a day where you can hold the world´s encyclopaedia in the palm of your hand there still is no better product to keep you warm than the timeless textile of wool. As an avid backcountry skier I can attest to the need for quality wool. Some products claim to be wool but are only really as low as 25% wool so make sure to read the fine print when looking for gear. 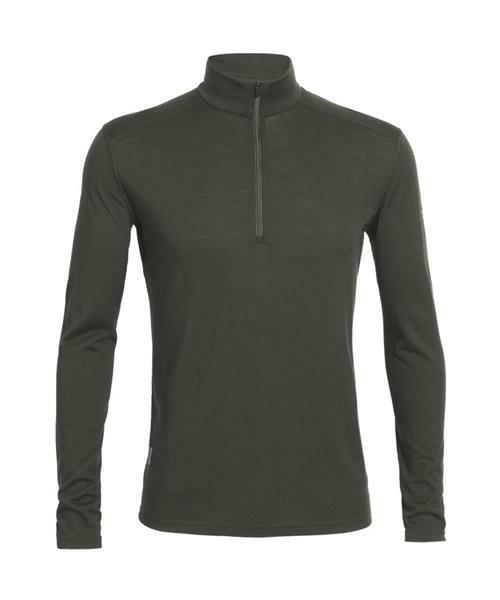 This 100% merino wool shirt will keep you warm even if you build up a sweat breaking a trail in 15cm of fresh. Stay safe and check the forecast before you go! Rated 4 out of 5 by TimDos from Good Longsleeve I cycle and fish so I am out in the sun and worry about sun damage. I doesn't help that I dislike the feeling of sunscreen on my skin - so I try to minimize it. This is my 6th icebreaker long sleeve/high neck top. They make great cycling tops because they keep the sun off my skin and evaporation off the wool is surprisingly cooling. The warmest I ever rode in was 42c and I felt fine. Same thing for bonefishing in the Caribbean or fishing at home in the summer - breathable sun cover that does the job. Rated 5 out of 5 by Gate123 from Just perfect! Can't ask for better. Just perfect for every Day use. Rated 5 out of 5 by penelope1 from versatile shirt I bought this for my husband, who gets a ton of use from his IceBreaker outerwear (jacket and vest). His other items from IB are a size Medium, but I decided to get this shirt in a Large, and am glad I did. It is very slim fitting, which would be great if you plan to use it solely as a base layer, but my partner likes to wear a short sleeved shirt under it sometimes, or to just wear it on its own (without looking like a skin-tight undershirt!). It's great.